I have a secret guilty love of stickers. Ever since I was little, I loved to collect pages of cute little characters, hearts, shiny stars, etc. Only I did not put them in sticker books like so many of my friends– because that would be wasting them. In fact, I’d carefully- carefully- choose when and where to use them. To such extent that I still have, somewhere in my collection, a sheet of glittery chubby flower babies with 4 stickers remaining. They were my favorite stickers as a kid. They take the focus away from “Hey you ripped off/crossed out that address and sent me this half beaten envelope” and turn it into “Aww, what a cute label!”. And I save an envelope, some resources, and some $ in the process. 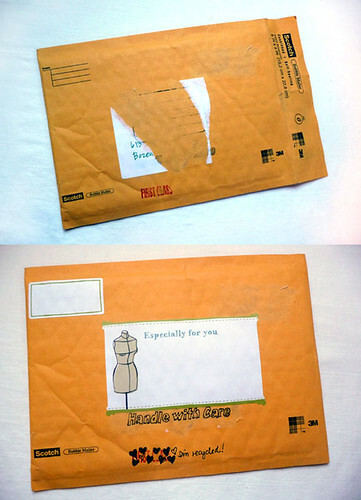 Hopefully they also inspire the person receiving the envelope to continue to re-use it until it falls apart. And to inspire you to do the same, and to litter the world with pretty crafty stickers, Chronicle Books has so kindly donated one pack of Crafty Stickers for me to give away to one lucky reader. The packet has over 200 stickers to choose from- and don’t worry, there are at least 2 of each design, so you don’t have to save them for 20 years to find the perfect place for each one. To enter to win, tell me what you would use the stickers for- or, describe your favorite/most memorable sticker– in the comments. Eligible comments must be left by Sunday at 10 pm mountain time. Good luck! I too had a huge collection of stickers as a child that I would never use. I had a whole shoebox full of them. I would even take the stickers off my homework and stick them on wax paper when I got home. I started teaching ballet about 6 years ago and used them on the floor as sort of a seating arrangement so the little ones would know where to sit and stand during class. And I would give them a sticker on their hand after each class. They loved them because they were different each class. 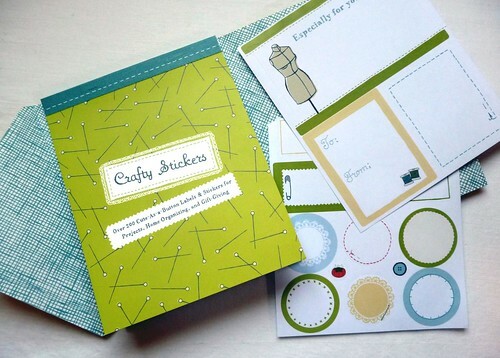 I don't teach now, but I would use them to label my yarn and craft bins and also use them for birthday mail. I love stickers! I would use them to decorate packages and cards for gifts and thank you's. What a fun giveaway! I'd use them on packages, both for mailing and for gifts. Lovely stickers.I would use these for my swap packages and perhaps some can use my daughter too. hmmm. pardon me as i am unable to express myself well...my most memorable sticker would have to be the sheet of precious moments stickers that was given to me by my aunt before she migrated. it has been about a decade since she gave it to me and i still have yet to use any of it. when i look back at my sticker collection, that sheet of sticker indeed brings back alot of happy memories that i had with my aunt. she was my closest aunt who was always treated me like i was her daughter. indeed, that sheet of stickers is very dear to me and i truly treasure it.